We're Indian Wedding Planners who have worked with Wedding Favors Unlimited for nearly a decade. They've come up with creative ideas for wedding decor and have supported our efforts to upgrade Indian Wedding Decor by creating products unavailable anywhere else. We hope this blog post helps you bring a more updated, modern look to your Indian wedding. There are a lot of opportunities to bring small touches to a wedding that’ll let family and friends know you want to honor your or your groom’s Indian Heritage, while still planning and decorating that modern wedding of your dreams. Join us below for some of our favorite ideas. An often overlooked detail are the gift bags families often give to relatives that are staying at the local wedding hotel. For Indian Weddings, hosts often insist supplying a bag full of water (which you can personalize), fruit, nuts and their favorite Indian sweets. Often times, just going to Costco and loading up on snacks to distribute in the bags is good enough. We liked this bag to add a modern touch because of the creative design along with the blue jewel that makes it different from the typical bag. The red hues combined with the Indian designs let guests know the Bride and Groom are paying attention to unique details to bring their traditions forward. You may or may not have a Sangeet, and if you do, they are often not decorated in immense detail like a wedding reception or a wedding ceremony. However, there still are a few small details you can add for a modern touch. For one, cocktail napkins are a cheap and easy way to get the Indian theme incorporated into the decor. There are several personalized options you could pursue, and better yet, you can buy them in bulk and use them again at the Cocktail Hour during the Wedding Day. Their incredibly cheap and a great value for the money. The other detail we like are these small indian themed candle. Something similar to this can be a great touch to a Sangeet table, especially if you dim the lights for the singing or any other presentation. The pictures will come alive with the colored candlelight shining through the glass. 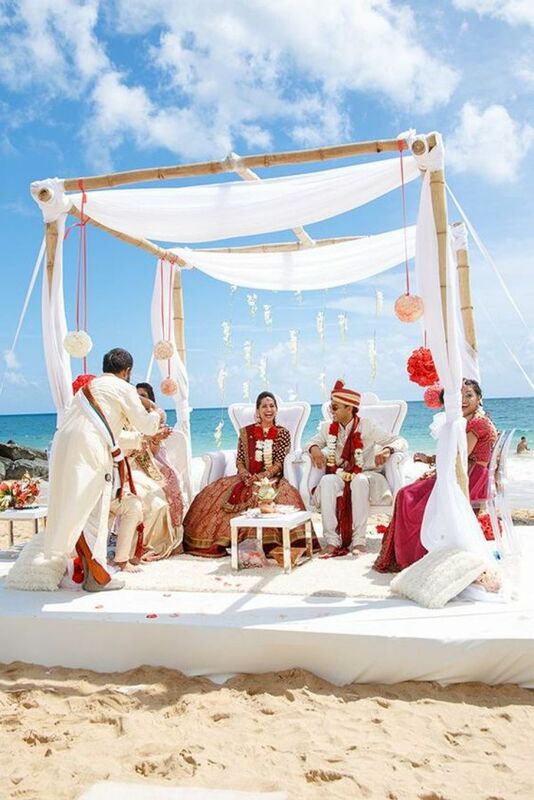 So many places to add a modern touch to a wedding ceremony, but we’ll only mention two here: The program and the Mandap. For many brides, who want a very American wedding, they still want to add a few small details to honor their partner’s heritage. 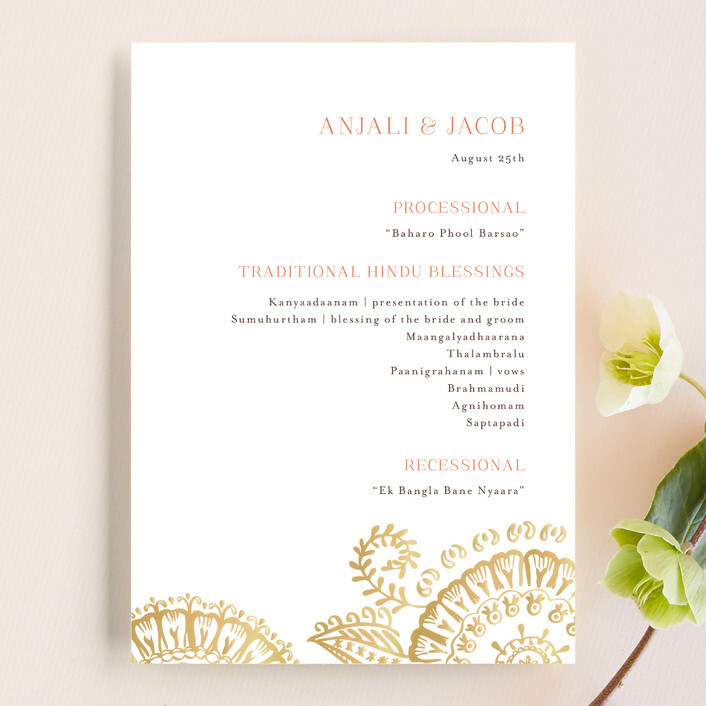 The Program is a great way to incorporate some Indian designs and fonts to let the other family know that Indian culture is still present throughout the wedding ceremony. We recommend this design by etsy. The printables are easy to manipulate and add your own touch. For a Mandap the internet is full of gaudy, over-the-top, glowing Mandap designs. Let's be honest, we are not likely spending what Priyanka Chopra did on her wedding stage, but we're going to want to include some of the elements. One of the most comment elements are the drapes. You can consider colorful, poofy drapes, or you can consider drapes that simple. As a Modern Indian Bride, our wedding planning team has recommended that you won't need anything more than a few simple white sheets. From our favorites above, you can see that it doesn't take much to have a modern look to such an important traditional aspect. For mandap decor, have fresh flowers hanging throughout the mandap. You don't need to go overboard with flowers everywhere. 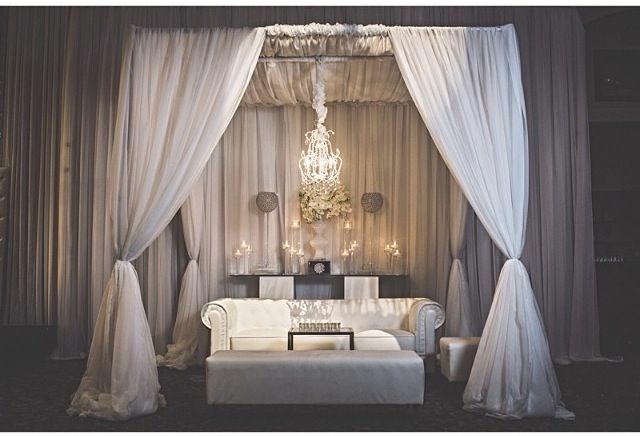 Satin drapes have been popular in the last few years, they're often slightly more expensive, but produce smooth lines that are difficult with other the wedding state with flowers (usually in whatever color theme you’re going for). We include a few examples above. We wanted to share that we don't think pillars and archesor artificial flowers are appropriate. Decorators agree with us that even have a few strategic flowers are better than pillars and arches. As a modern bride, less is more! We love the trinket dishes because they’re not just for women. Men have wedding rings and other things they’d be happy to collect. They’re also great for Bridal Showers (especially the Mendhi ceremony) and the Sangeet. While trinket dishes have been newer Indian wedding favors, by far the most popular wedding favor we see are elephant tea light candles. They’re cheap, come pre-packaged and are lovely gifts for your guests to take home. They’re also great decorto use at the cocktail hour if you happen to have too many extra and want to add an extra decorative touch. A few other ideas are the favor gift baskets, and candies in these cute elephant favor boxes. For a cheap and easy idea, just fill the cute elephant favor boxes with mints and put them at each place setting (or jelly beans for a sweet treat). So many ideas here, but we’re going to only share our two favorite table top Indian Wedding Decorations: Indian Wedding Lanterns and Table Candles. We’ve mentioned candles before, but the Table Lanterns we’re showing above are among our favorite decor items for a modern Indian wedding because they’re simple, inexpensive and add a touch instantly to any wedding. Not typically on a list for Indian Wedding Decorations, but this has been increasingly popular as many events have hundreds of people moving around. We’ll admit, it’s been tough to find Modern Indian fonts that are legible by Americans! We think we’ve found the ticket with these sign options from Kate Aspen (they also come in Teal). They’ve come up with some great directional signs that let you announce where is the ceremony and any other events. Because we all know too well that Indian Standard Time is a real thing! Here's a creative and practical piece of Indian Wedding Decor. If you’re willing to spurge, you can combine these glasses at the cocktail hour with also turning into the wedding favor. Guests appreciate the fact that you’re giving them something that they’ll use all night and take home. One thing to make sure: Make sure they have a place to empty all their liquids before they go home. And offer them a box (or favor bag with treats) for putting the glass into for protection. As we mentioned earlier, cocktail napkins with an Indian Theme are also an easy way to add a modern Indian wedding decoration detail. Flowers are always the most expensive part of Indian Wedding Decorations. But being a Modern bride is an advantage, you'll be able to honor your traditions...with fewer flowers. There's no doubt that fresh flowers will be a part of your wedding stage and stage decoration. But floral decorations are often where modern brides can cut back and create an equally impressive experience as the more colorful and intricate floral arrangements. As contrary as it sounds, picking a single flower color and using 1-2 flowers consistently across your mandap or reception stage. Our favorite modern floral idea is above. Here the Mandap didn't even have garlands or draped flowers. Instead, simple bouquets of flowers were used to secure the drapery for the mandap. We hope these have been helpful modern Indian wedding decoration ideas. If there's an area you'd love for us to explore (banquet, wedding venue, reception decor, the photo booth, etc), let us know in the comments and we're happy to elaborate. We also made a wedding decor checklist, we hope it helps! Wow! These decorations are truly beautiful. Thanks for compiling all these beautiful ideas into one post, there are some great ideas! Thanks! And on top of it..they're affordable ideas. Great question. Honestly, because Indian families are so spread out, it's tough to find this decor outside of being online. We had to hunt these ideas down ourselves, and that wasn't easy. We have a post coming up about Indian colors. Hope you enjoy it. There are so many different cultural and religious traditions behind marriage, and to me, this is a big part of what makes them so special. Not only is it about honoring your love but also your family and appreciating them. Thanks Iris. There are a lot of religious traditions and we hope our decor can add a little touch of tradition.